A HAUNTING TALE TRANSFERS FROM LONDON! This chilling new play written and directed by award winning playwright Conor McPherson transfers to Broadway from the West End. The Seafarer begins previews appropriately on October 31, 2007 with an official opening date of November 15, 2007 at Booth Theatre. The play runs two hours with no intermission. McPherson masterfully blends Ireland, the sea and the power of myth to create a haunting theatrical experience. The story takes place on a fateful Christmas Eve in a dreary basement in Dublin. Sharky has just returned home to care for his aging older brother who has recently gone blind. He along with his old drinking buddies, Ivan and Nicky, are hoping to indulge in a game of cards when a mysterious stranger from the distant past shows up and raises the stakes higher then any of them could have imagined. Sharky soon realizes that they may be playing for more than just money perhaps their very own souls. Could they be battling the Devil himself? 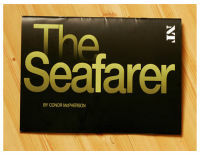 The Seafarer made its successful world debut in 2006 at the National Theatre of London and received two Olivier nominations including Best New Play. The British Press called the production a “Sparkling and suspenseful new play” (Guardian). The critics were also fond of McPherson who is the author of the Olivier award winning The Weir and the Tony nominated Shining City. The show has also been compared to The Homecoming another current Broadway production. The British publication the Stage said, “Making his brilliant National Theatre debut as author and director, Conor McPherson’s new play powerfully recalls Pinter’s The Homecoming.” Reprising their London roles are Conleth Hill and Jim Norton who received the 2007 Olivier Award nomination for Best Performance in a Supporting Role. The play also stars David Morse in a rare Broadway appearance as Sharky. Morse is best known for his television and film roles including the movie 16 Blocks with Bruce Willis and the television series Hack. This production tells a compelling tale of dealing with one’s inner demons. The characters are taken on a truth revealing soul searching journey and are forced to dig deep inside themselves, but they may not like what they see. Like some of McPherson’s other plays it is a ghost story that combines humor and drama creating a chillingly profound tale of the supernatural. It is certainly different from anything else currently on Broadway. The Seafarer is a spine tingling good night at the theater. Come find out why the critics are raving about this haunting new play. Get your tickets today! The Seafarer tickets sell from the box office for between $76.50 - $96.50. Premium seating for sold out shows are selling for between $215.00 to $300.00. To view a great selection of The Seafarer Tickets click the link! Take the N, R, S, 1, 2, 3, 7, 9 trains to to 42nd Street and Times Square.